Merrick, NY—Centurion is where the country’s leading prestige jewelers and top-quality exhibitors gather every January to start planning their business year in a fun, relaxing environment. Thought-provoking speakers target the luxury jeweler with one of the most informative and timely conference programs in the jewelry industry, while friends new and old gather in a five-star luxury resort for camaraderie, networking, and great experiences together. It’s no wonder so many people call Centurion their favorite show of the year! Start your Show experience early with the all-new Centurion 2018 Preview Book. Just released, the book lists our exhibitors, sponsors, a full event schedule, and gives a sneak peek at some of the beautiful product that will be on display for your merchandising needs. The Centurion 2018 Preview Book celebrates the stories that can help you sell more. In the book, more than 30 designers and manufacturers tell their stories of success, with information and inspiration to use at the sales counter. The Preview Book also announces the three Emerging Designer Competition winners for 2018, a unique opportunity to discover designers who have never exhibited at a U.S. fine jewelry trade show before Centurion 2018. 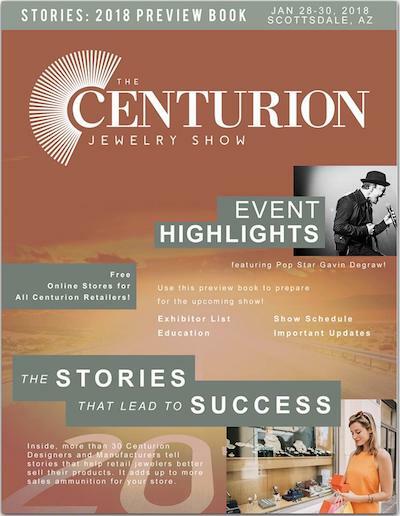 This year’s Preview Book also introduces Centurion and H2 Events’ newest tool for the jewelry industry: JewelryEComm.com, Centurion’s e-commerce learning center, and the Centurion Freecomm Platform, a new state-of-the-art online store system using customized Magento 2 software and hosted by H2Events. Both exhibitors and retailers can use the new store to augment or get more sales exposure for their inventories. Both programs will debut at the Show, but you can read about them in more detail from pages 30 – 35 in the Preview Book. Click here or on the image below or paste the link at bottom into your browser to access the Centurion 2018 Show Preview Book. What is the first day of the week?